About two months ago, Formula One Managment released their new logo, and it’s you know, fine. It’s not an amazing triumph of design, but it does the job. The problem is that it already seems to be doing a job, just for 3M, selling a line of compression socks and tights and gloves. 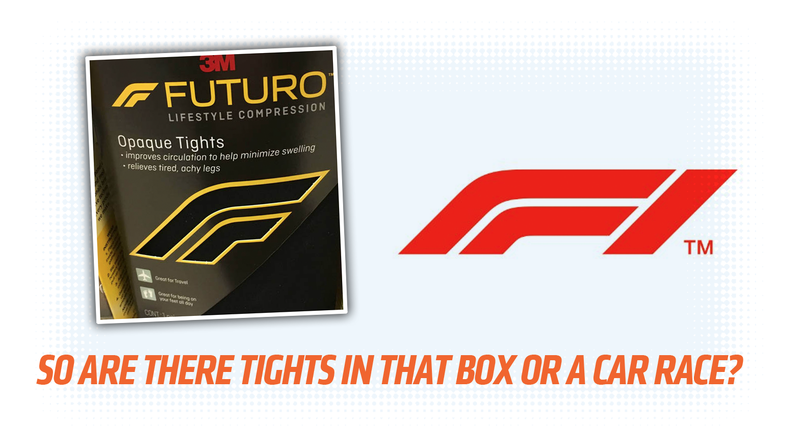 The 3M brand is called Futuro, and, sure, that stylized F used as the Futuro logo is really, really similar to the F used in the F1 logo. The proportions and angle are slightly different, but not that much. The similarities are pretty obvious. Those are pretty close, too, but nobody’s going into a Ford dealership to get a new heat pump for their house, because people, despite a lot of internet-based evidence to the contrary, are not idiots. It’s not clear how much 3M regards the logo as a genuine threat to its compression-sock business, or if they’re just defending their logos and brands because, legally, that’s sort of what you do. The world is certainly full of similar looking brands and logos, and 3M may decide this just isn’t a big deal. Or they may force the F1 management to redesign the logo yet again. I guess we’ll just have to wait and see. ...and confusion there seems a hell of a lot worse and likely than mixing up some tights with a race series.